The selective breeding of the nineteenth century is responsible for the shortened face and the distinct color varieties we see today. Careful breeding is required today to maintain both the shortness of muzzle and the solid colors. The breed, however, has stayed stable since the mid nineteeth century, changing far less than some of the breeds that has undergone profound changes, the English Toy Spaniel has seen very little change. The first official standard was developed in the history of the breed and wishing to be surprised by the similarity of the historic dogs with those of today, I highly recommend two books. Mrs. Neville Litton's Toy Dogs, and Their Ancestors published in 1911 and now virtually unobtainable, gives a lengthy treatise on the breed. With its beautiful historic plates and clear drawings, this is a seminal work on the breed. Alicia Pennington's Royal Toy Spaniels, provides a modern discussion of the breed and excellent depictions tracing its history. In the United States, the breed has a long and distinguished history. The English Toy Spaniel was among the first toy breeds accepted by the American Kennel Club. Midway Park Beauty in 1886 was the first AKC registered ETS. At that time only the English Toy Spaniels, Italian Greyhounds, Pugs and Yorkshire Terriers were the AKC recognized toy breeds. 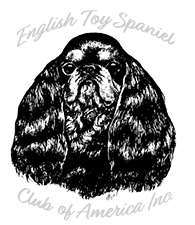 In 1986, the English Toy Spaniel celebrated 100 years of AKC recognition. It is for this reason that ETS fanciers are often taken aback and may even seem offended when well-meaning toy enthusiasts, unfamiliar with the ETS, ask if it is a new breed. The English Toy Spaniel is a very old breed that still is true to its heritage. They were never bred to work in any way, for they are the true companion dog. The artistic renderings and the historic treatises on the breed point to a history of centuries of loving companionship still enjoyed by fanciers today. Dr. Amanda Watlington holds a PhD. In Classical Languages and an MBA in Marketing. Amanda has been a breeder-exhibitor of English Toy Spaniels for over 15 years under the Maranda Prefix.